Preface: We don’t contest that World War II was – in many ways – a “good war”. The Nazis, imperial Japanese and fascist Italians were nasty folks trying to take over the world, who brutalized millions within their own borders and in the nations they occupied. 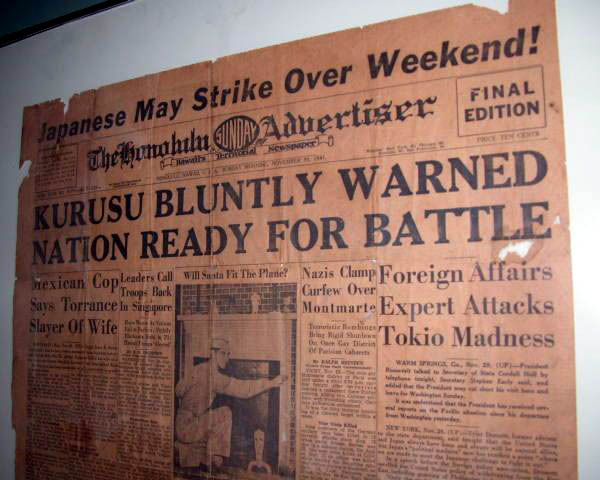 It has also recently been discovered that the FDR administration took numerous affirmative steps to ensure that the Japanese attack would be successful. These steps included taking extraordinary measures to hide information from the commanders in Hawaii about the location of Japanese war ships (information of which they would normally be informed), denying their requests to allow them to scout for Japanese ships, and other actions to blind the commanders in Hawaii so that the attacks would succeed. See, for example, this book (page 186). In addition, the heads of the Army and Navy suddenly disappeared and remained unreachable on the night before Pearl Harbor. And they would later testify over and over that they “couldn’t remember” where they were (pages 320 and 335). Two weeks after Pearl Harbor, the Navy classified all documents top secret, and the Navy Director of Communications sent a memo ordering all commanders to “destroy all notes or anything in writing” related to the attacks. More importantly, all radio operators and cryptographers were gagged on threat of imprisonment and loss of all benefits. (page 256). The commanders in Hawaii, General Short and Admiral Kimmel, were scapegoated as being the cause for the “surprise” attack on Pearl Harbor (they were recently cleared by Congress). And, according to a statement made to me privately by a leading Pearl Harbor scholar, the government repeatedly denied foreknowledge and labeled anyone who discussed the military’s prior knowledge of the attacks as a nutty conspiracy theorist. Postscript: Coincidentally, Philip Zelikow, the Executive Director of the 9/11 Commission, the administration insider whose area of expertise is the creation and maintenance of “public myths” thought to be true, even if not actually true, who controlled what the 9/11 Commission did and did not analyze, then limited the scope of the Commission’s inquiry so that the overwhelming majority of questions about 9/11 remained unasked, also happened to be the main guy defending the alleged unforeseeablity of the Pearl Harbor attack, who wrote a hit piece on Pearl Harbor historians like Stinnett. It has been proven that 9/11 was entirely foreseeable and yet – unexplainably – all of the key military players just happen to have been unavailable and out of the loop when they were needed (and see this). But that’s just an interesting coincidence, because countries never use false pretenses to launch wars. Well, almost never, especially when it involves the innocent killing of our own people.